In the heat of service, it’s all about efficiency and being at your best. Little details are essential. And you’ll find the little details (like cooling crystals!) 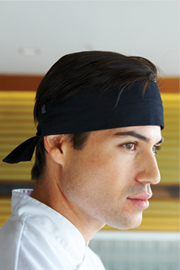 to help you perform with the chef head wraps from Chef Works. 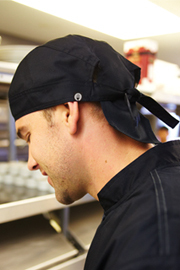 Built strong, but lightweight this one-size-fits-most chef’s head wrap is the perfect fit. Choose from either a poly/cotton blend or 100 percent cotton (depending on the model) and wear your chef head wrap with confidence thanks to secure back ties and a style built for the hottest kitchens. The Cooldanna can be worn on the head or neck, giving a polished look to any back-of-the-house uniform program.